I love surprises -- nice surprises, that is to say. Especially when they show up in the mailbox unexpectedly. Or even when you are expecting something and you look every day just in case it's arrived already. December had a few of those nice surprise days and I'm pleased to share a glimpse of them with you today. Early in the season, I signed up to participate in Amy @ Love Made My Home 2015 Christmas Card Swap. Everyone who joined was paired with another blogger who could be located anywhere in the world. How exciting -- what a great way to meet new bloggers from all over the place. And it's a wonderful way to keep the old-fashioned Christmas card exchange alive (I think it's a lovely tradition -- even though I also enjoy sending e-cards there is something special about getting a card in the mailbox that you can open and display on your desk or mantelpiece). 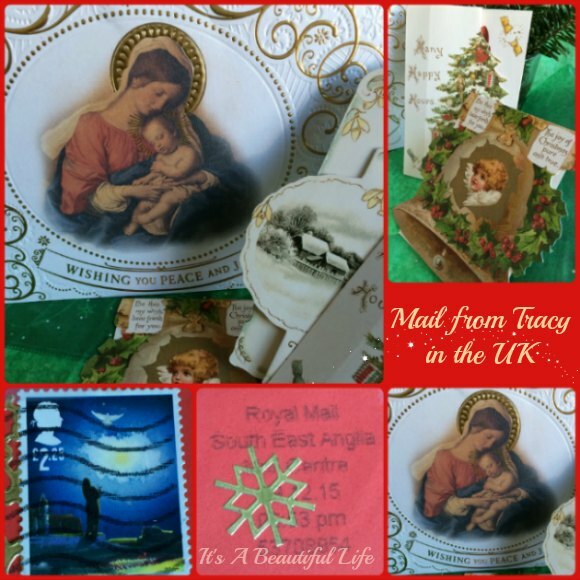 What a treat then to receive my beautiful card from Tracy @ Mad About Bags who lives across the pond in the United Kingdom. It came by "Royal Mail' you will note. Tucked inside the card I found a little treat of three miniature Victorian-style Christmas cards. I love Victoriana and so this was a lovely surprise indeed. Thank you, Tracy! And to Amy for hosting this fun exchange. 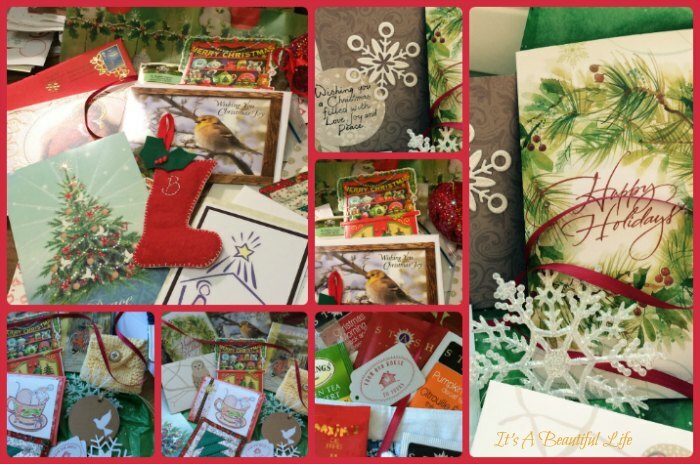 Earlier this year I was invited to be a part of a card and tea exchange with some fellow Canadian blogging friends. This is a year long exchange of cards, tea, and sometimes other little treats that can fit in a small envelope, and are to be sent out for birthdays, Christmas, Easter, Canada Day, and Thanksgiving. You can well imagine the anticipation as December arrived to find swells of festive treasures in the mailbox. It truly feels like Christmas. It's been delightful and fun to share -- and expect -- little treats from these lovely bloggers spread throughout the year. Do you buy yourself Christmas presents? I must admit I do. Above are two that came in the mail a couple of weeks ago. And, on a whim the first Sunday in December, I quickly wrapped the calendar in tissue for myself, as I had a little something for Hubby (we hadn't planned ahead you see). A spur of the moment little Advent exchange that I'm hoping will fast become an annual tradition. The very act of opening a packaged wrapped in festive paper was still thrilling ... it hardly mattered if we already knew what was inside. This week it was my hubby who surprised me with a little package that arrived with coffee and toast in bed. 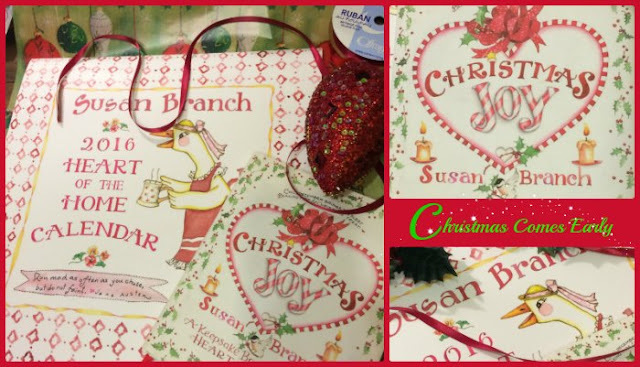 That dear Susan Branch surely knows how to spread Christmas Joy with all her whimsical and delightful artwork. I am so looking forward to displaying the 2016 calendar in the new year. And the little Christmas Joy book, which I found for a song as a second hand book online, well, that is a joy too! Especially as I'm going to be sharing it with a loved one this Christmas. It's here ... the count down to Christmas begins in earnest now. Five more sleeps. I still have some things to prepare, but it's all fun from here on in. How about you? My mom is here -- we've been eating Christmas oranges and whipped shortbread, and she's been wrapping presents for me this morning. When we get the little stack done, I'll be sure to take pictures. 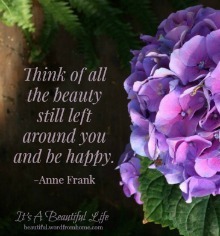 Wishing you a beautiful day and a wonderful week ahead. Will share tree pics tomorrow. I'm visiting from Amy's card swap! What a lovely Christmas card you received! Wishing you a Merry Christmas!!! I too have enjoyed Amy's lovely card swap, so nice to be introduced to so many lovely new bloggers. What beautiful and historical styled cards. 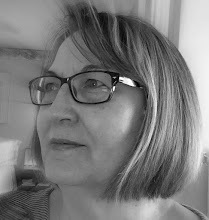 It was great fun swapping cards and getting to see so many new blogs. I love all of you wonderful surprises in the mailbox. Have a great Christmas. What a lovely, thoughtful post, as always! Merry Christmas, Brenda, to you and your family. I just love the idea of your Christmas card swap and the tea exchange. 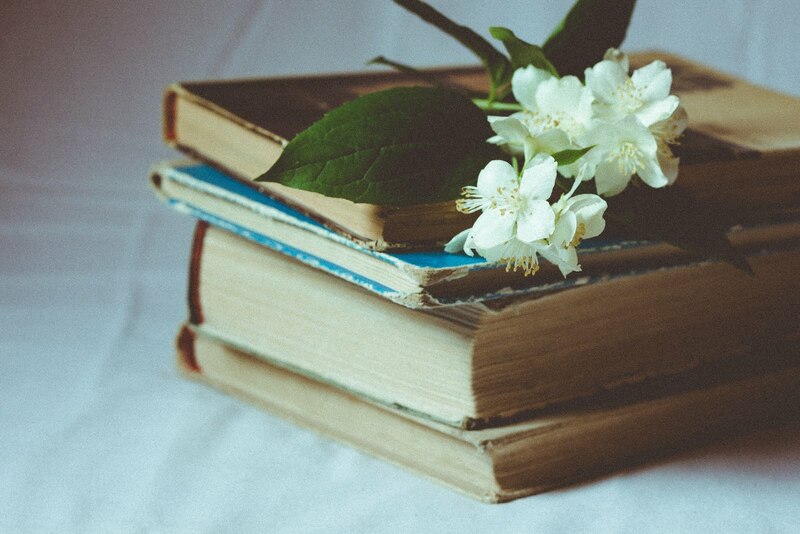 Little things that truly do "scatter joy." Will be looking forward to the photos. It's been a great year for real mail in my mailbox, too. Such delightful things show up! Much better than bills and flyers. Wishing you much joy as you celebrate the birth of the Christ Child. Love to get real mail in my mailbox. It's such a treat in these days of texts and emails. I love that you Canadian bloggers organized this swap. I also loved being surprised by fun mail so I've really enjoyed our fun swaps. Thank you for the e-card! I'm glad that you liked the goodies that I sent you. Merry Christmas, Brenda! Surprises in the mail box are such a treat. A tea exchange sounds delightful. Merry Christmas to you and yours. 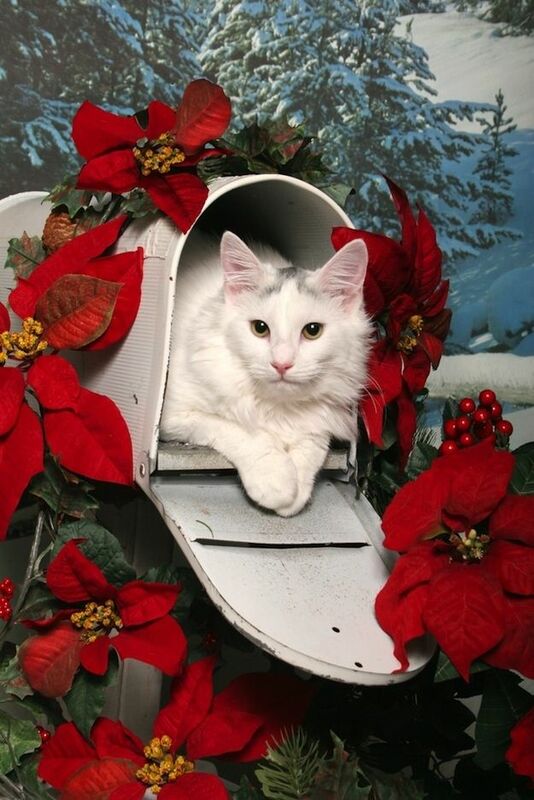 now that would be a surprise to find a cat in the box. i use to deliver the USA mail. that was fun. i did have a bee many times, a salamander, a squirrel, a bird. i think that is all of the funny moments. you never know. they are perfect for critters.